El Capitan viewed from Cathedral Spires. Yosemite is big wall paradise. The walls are enormous, the rock solid, and the weather ideal. Below I have offered a primer to help you plan a Yosemite big wall adventure. I have also included some personal tips and techniques and the gear I am currently using. Enjoy! Yosemite offers short practice aid routes, 3000-foot A5 nightmares, and everything in between. No matter what you plan to climb, you will need basic free climbing and aid climbing skills before you arrive in the Valley. 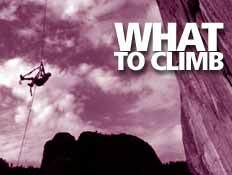 Train in both a climbing gym and your local crag and read our How To Big Wall Climb Book. Consider purchasing Road to The Nose, a guidebook that offers advice on training for Yosemite big walls and also includes numerous topos for moderate routes. For a more complete selection of big wall routes, check out Yosemite Big Wall SuperTopos. The Pacific Ocean Wall is an intimidating climb with a very moderate first pitch. This is a great first aid climbing lead. This pitch offers sustained nut and small cam placements with a few "aid boulder problems" below the anchor. This wandering and adventurous climb leads to El Cap Tree, an 80-foot ponderosa, the only major tree on El Capitan. These two pitches ascend the lower portion of an enormous 600-foot dihedral. They are sustained and involve some tricky placements. A great first aid lead. Some of the placements are a little awkward but they are generally secure. 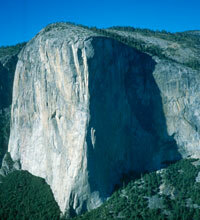 Below are five moderate Yosemite big walls. 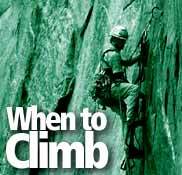 None of these climbs is easy and you will need to have your aid skills wired before attempting one. Most of these climbs are included in the Road to The Nose guidebook. A popular first wall. This climb is probably the easiest Grade V wall and is usually crowded. Probably Yosemite's shortest Grade V wall but also the most overhanging. Most of the crux sections have fixed gear and there are many bolt ladders. A steep and popular route. While most crux sections are fixed, the exposure and thin crack systems make this climb challenging both mentally and physically. A true Yosemite classic climb. While only two pitches long, the exposure will make you feel like you're halfway up El Capitan. A more difficult and less crowded variation to the South Face. My (Chris McNamara's) favorite route. Loads of quality free climbing in a spectacular location. Most of this route can be climbed at 5.9 or easier. Considered by many to best rock climb in the world. Period. Almost as classic and slightly harder than the The Nose. Many memorable pitches and ledges. One of the more moderate and shorter routes on El Capitan. The first half requires mostly aid climbing and the second half requires mostly free climbing. The most moderate route on El Capitan's overhanging southeast face. Spectacular exposure and easy hauling. More than 100 climbing accidents occur every year in Yosemite. The two documents below include some helpful information to help you avoid an accident. The document below contains a number of tips that all big wall climbers should adhere to in order to keep Yosemite the climbing paradise it is today. Also, here is a great thread on making a poop tube or big wall waste system and a discussion on big wall passing ethics. Since 1997 the American Safe Climbing Association has replaced more than 800 bolts in Yosemite. Some anchor information is available for certain climbs on the route beta pages. For the most up-to-date information on each routes anchors conditions, visit the ASCA web site. The Leaning Tower at sunset. 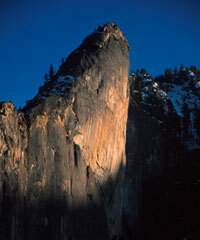 Travel information is available on the Yosemite Rock Climbing info page. Yosemite has some of the best weather of any climbing area on earth. That said, note that it could storm at any time in Yosemite, and often heavily. Climbers should always prepare for the worst on big walls by bringing adequate bivy gear (see Staying Alive). The best times to climb are in the spring and fall. The summer can also be great once you get a few pitches up and out of the heat. In the winter, the Valley empties of both tourists and climbers, giving a much more pristine feel to the climbs. Winter can have good climbing weather but can also have months of uniquely wet and severe Sierra storms. Nov. 15March The walls and Valley are relatively empty with usually at least one five-day spell of good weather per month. On any winter ascent prepare for the absolute worst, as Pacific storms can last up to a week or longer and bring heavy snow and rain. The driest and most protected routes are on Washington's Column, Leaning Tower and the Southeast Face of El Capitan. AprilMay 15 Walls and the Valley are still uncrowded, but there is a 50/50 chance of getting either good or miserable weather. This is also the time of some of the wettest Pacific storms. You should still stick to walls on Washington's Column, Leaning Tower and the Southeast Face of El Capitan. May 15June Perfect weather and big crowds both in the Valley and on the walls. Almost every route is dry. JulyAug. The Valley is still crowed with tourists, but the walls are uncrowded. While Valley floor temperatures are often in the 90s and 100s, temperatures on the walls 500 feet above the Valley or higher are usually comfortable in the 70s and low 80s. Be prepared with plenty of extra water. Sept.Nov. 15 The Valley is crowded with tourists and walls are crowded. Mostly cooler weather with an occasional heat wave. The first winter storm usually arrives in late October or early November. Camp 4 - Steve Roper's definitive book on Yosemite climbing history from the beginning to 1970. A must read. Defying Gravity - This book is less personal and authoritative than Camp 4 but covers a broader period of time and has more photos. El Capitan - Dan Duane picks a handful of Yosemite personalities and explores what made them tick. Vertical World of Yosemite - A collection compiled by Galen Rowell of the best Yosemite first ascent accounts. How to Big Wall Climbs - The most current "how to" aid climbing book written by Chris McNamara. Yosemite Big Wall Obscurities - This free download includes hand-drawn topos of obscure Yosemite big walls. NOTE: these topos are of dubious accuracy. Yosemite Big Walls: SuperTopos - The most detailed and informative guide to Yosemite's most popular big walls. Road the The Nose: SuperTopos - A step-by-step guide to help you prepare for climbing a Yosemite big wall.